I find the recent tendency to grill politicians over their family lore peculiar. Over the last year, Marco Rubio, Elizabeth Warren and Susana Martinez have all taken their turn in the spotlight for elements of their family history that may or may not be true. I suppose I find this perplexing because avid genealogists are well aware that tales passed down through the generations tend to be accepted and protected by those who inherit them, if only because we usually trust the elders who first shared them with us. The catch, of course, is that they can morph over time (think of the children's game of telephone conducted over a period of decades rather than minutes). In some families, fiction eventually starts to outweigh fact, but truthiness trumps, so legend-heirs continue to believe. And politicians are not immune. "Now I want to tell you about my grandmother, Victoria. By the time she was 6-years old, my grandmother was an orphan. She had to leave her home in Mexico to come to San Antonio with relatives who had agreed to take her in . . . She spent her whole life working because of her lack of education as a maid, a cook, and a babysitter - barely scraping by but still working hard to give my mother a good chance in life, so that my mother could give me and my brother an even better shot." She was born in San Pedro, Coahuila, Mexico in 1914. 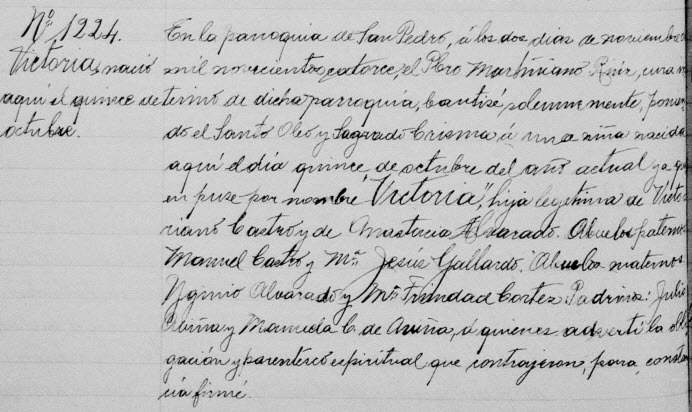 It would appear that she was named after her father as her parents were Victoriano Castro and Anastacia Alvarado, but given the circumstances of her life, it's entirely possible that she never saw this document because she was indeed brought to the U.S. at a young age. 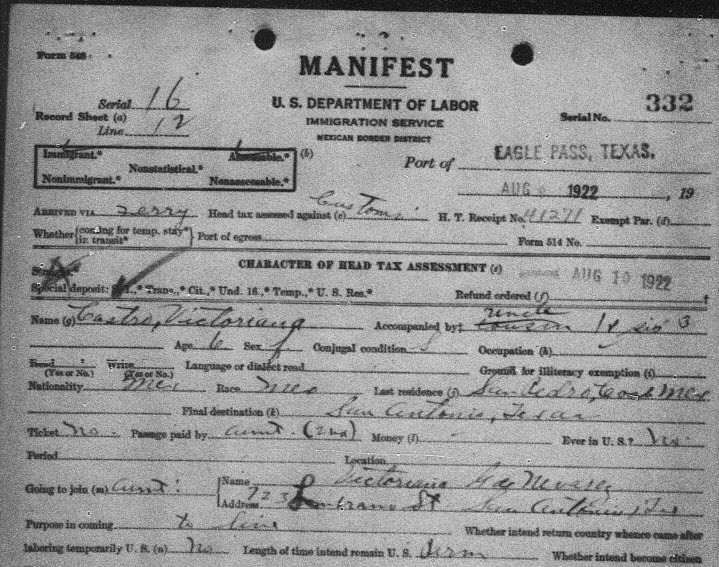 This arrival record is one of several documents that show Victoria(na) and her little sister being brought to Texas by an uncle in 1922 - a journey that seems to have been carefully coordinated by a cluster of relatives, a couple of whom already resided in San Antonio. The manifest notes her age as six. She was actually seven, but even she and her relatives didn't know that - a then-common situation that 21st century descendants sometimes find difficult to comprehend. I followed her forward in time and winced when I discovered that the substitute mother who had taken Victoria in as a child died while she was a teenager - twice deprived so young. But it was also clear that she had a safety net in the form of her extended family and that she and her sister remained close. And at least once, while still a young woman, she had a chance to return to Mexico. So Mayor Castro's family lore rings true. His grandmother, with a family tree extending back to Coahuila and Zacatecas, came here as a young girl and was taken in by relatives. Two generations later, her Stanford and Harvard-educated twin grandsons both hold public office. Julián Castro was recently quoted as saying, "My family story, like many in the U.S., is an American dream story." He speaks the truth.